I finally did what you suggested and ordered the correct seal. Then I waited for cold weather so I could enjoy working on the car in the cold! I am chasing a spark issue and I am relatively certain it is the coil as there is a burnt spot on the side of the coil that fits into the metal holder..... I digress too much...back to the issue. I removed the distributor.The "O" ring and seal were extremely hard and brittle. 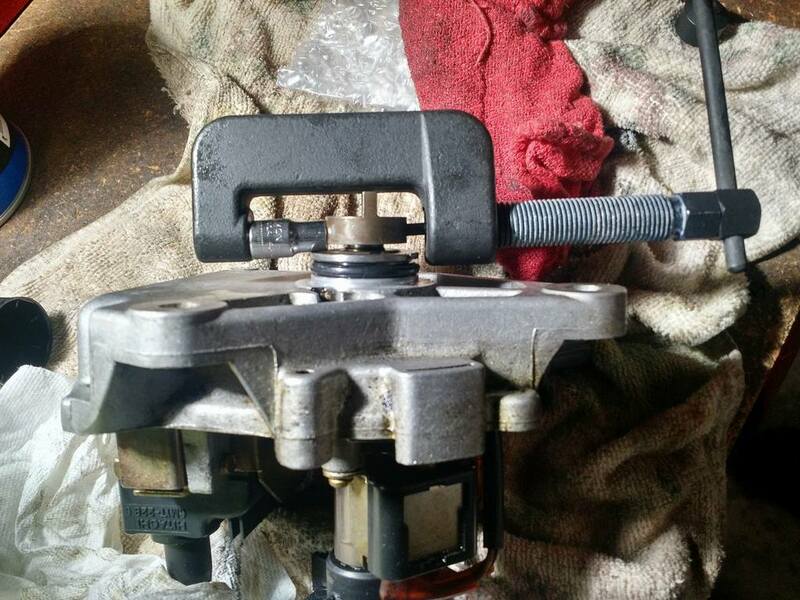 I removed and replaced the "O" ring (purchased at my local Honda dealer) and I have the shaft and seal out. The ball bearing seems a noisy if I hold the bearing and spin the shaft. The bearing appear to be pressed on and the shaft has two different od's (end next to rotor is much smaller diameter than the side the bearing seats on the shaft). I think I can get the bearing locally, however, I am not certain how to remove the metal part that has the hall vane and attaches to the rotor. It appears to be threaded onto the end of the shaft. Does anyone know if it has right or left hand threads? Has anyone successfully removed the part and replaced the ball bearing? I thought about holding the shaft by placing a punch thought the pin hole that holds the coupler on the end of the shaft. Can you describe how you set up the distributor gear on the notched 2x4 to knock out the pin? In other words, with the 2x4 in the vise, did you just set the body of the dist on a table and whack at the pin. I'm assuming the notch was cut into a 2" side deep enough to hold the gear but allowing for the pin to move down as you whacked it? Thanks. I didn't use a vice. I just set it on top of a hard piece of exterior trim wood and drilled a 3/8" hole underneath to allow the pin to travel down. Then I just used a lot of muscle with the 2lb sledge and punch. It didn't seem like the pin would move but eventually it did. It's just pressed in there really tight. Last edited by jkowtko; 01-10-2015 at 09:36 AM. Fyi, thanks to the encouragement from grannie613, I just did mine ... here are some more pics. Yes, the pin is made of hardened steel and pressed in extremely tight. I was able to knock it out in a dozen or so good blows with a 1/8" punch and 2lb sledge hammer. Fyi the distributor was still warm at the time -- don't know if that helped or not. The punch actually deformed at the end under the impacts, but fortunately I was able to file it back to shape in order to get the pin completely out. Reinstalling the pin was a bit easier since I didn't have to use so small a punch. Thanks for the pics and notes. That pin is probably the most difficult part of the repair. Once I got my hands on a pin punch and heavy hammer, all was well. Be sure to get a 5/32" pin punch; it's the perfect size. I first tried an old 1/8" punch but it kept bending -probably because it was old and weak. 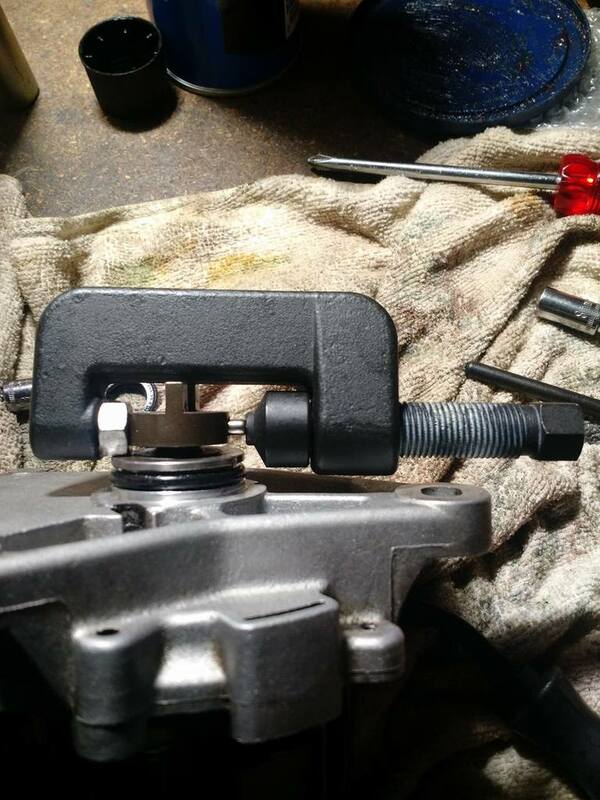 I replaced the inner seal today and used a motorcycle chain breaker/riveter for removal and install the pin. I couldn't imagine having to punch it with a hammer and punch, it was tight! do you have to lubricate the new seal before installing it? I would suggest wiping a bit of motor oil or silicone grease on it with your finger just so it's not completely dry.